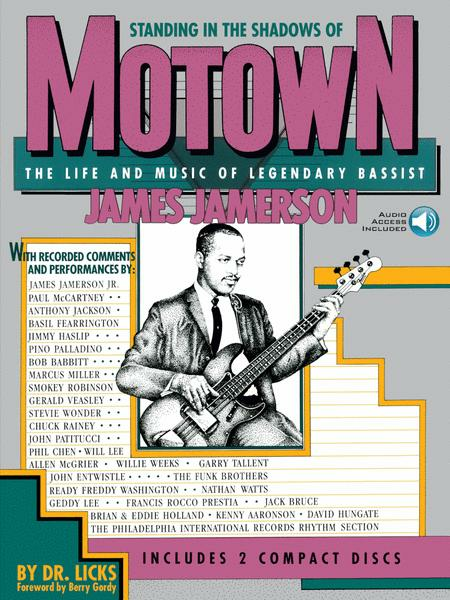 The Life and Music of Legendary Bassist James Jamerson. By James Jamerson. Guitar Book. Bass Reference, Motown, Biography/Composers & Musicians. Softcover Audio Online. 208 pages. Hal Leonard #0995023000. Published by Hal Leonard (HL.698960). Bassist James Jamerson was the embodiment of the Motown spirit and groove – the invisible entity whose playing inspired thousands. His tumultuous life and musical brilliance are explored in depth through hundreds of interviews, 49 transcribed musical scores, two hours of recorded all-star performances, and more than 50 rarely seen photos in this stellar tribute to behind-the-scenes Motown. Features access to 120-minutes of audio! Allan Slutsky's 2002 documentary of the same name is the winner of the New York Film Critics “Best Documentary of the Year” award! Songs include: Ain't No Mountain High Enough • Ain't Nothing like the Real Thing • Ain't That Peculiar • Bernadette • Come 'Round Here (I'm the One You Need) • Darling Dear • Don't Mess with Bill • For Once in My Life • Home Cookin' • How Long Has That Evening Train Been Gone • How Sweet It Is (To Be Loved By You) • I Heard It Through the Grapevine • I Was Made to Love Her • I'm Gonna Make You Love Me • My Guy • Nowhere to Run • Reach Out I'll Be There • What's Going On • You Can't Hurry Love • and many more excerpts and riffs.